Adcon stations are customizable equipments, which means you can add the type and amount of sensors you need. 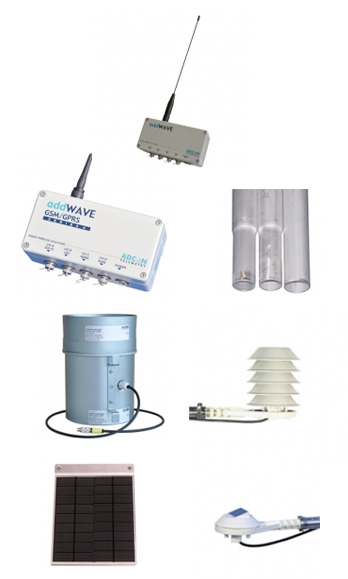 Types of sensors available: temperature, humidity, wind direction and speed, solar radiation, soil temperature and humidity, precipitation, leaf wetness, water quality, air quality, level control, etc. Communication: Adcon systems can be used with different types of transmission or communication systems, like UHF, GSM, GPRS, or a combination of the above. Information networks: these systems are qualified to communicate amongst themselves, thus increasing transmission capacities. By having different communication options, a network of information can be generated, and it can be analyzed on the same screen on the software without importing the distances between the stations. Communication systems: the equipments have several options to communicate between them: UHF (short and long distance), GPRS, GSM, or their combinations. Installation where each station communicates directly with the central or receiving base. This model applies only to UHF stations. A733UHF station communicates directly with the base A850 with no need of any other device or communication system. In this case, the base calls each of the stations to recollect information once the cycle is finalized. It begins again with the first station. The GPRS communication can look the same, but it is also involved in the GSM infrastructure and internet. Each long distance ADCON station, weather station, a pressure monitor or a special station, can also work as a repeater for another station for long or short distance. This not only increases the data transmission scope, but it also reduces infrastructure costs, since it decreases the need of elevated power sources, because it needs less potency, and uses small solar panels; also, it does not need installation of equipment dedicated only to data retransmission. On the other hand, the base station that recollects information from the stations working with radios in long and short distances, can communicate with GSM and GPRS stations, which allows the remote integration of isolated stations. Building an UHF structure is recommended, particularly in dense monitoring networks. However, on sites isolated from the network radio you can connect GPRS A753, A755 or A757 GPRS stations with no need of altering the base or the software that manages the UHF equipments. It is also possible to use the GPRS platform to collect information from the UHF stations, using RA440. At first, the receptor calls the UHF stations, once it finished calling these type of equipments it communicates via GPRS using RA440, which recollects the information via UHF of the remote UHF units, and sends the information back via GPRS. A universal software package that recollects, processes and charts the displayed information. The softwares flexibility makes it ideal for many weather, environmental, hydrological, leak detection, frost alerts, bomb monitoring, and other applications. Based on searchers, fully enabled for the internet. It has an integrated web server that allows users to have access to information from any part of the world, through an internet connection. It is fully programmed in Java, it can be used in operating systems with Windows and soon with Linux.